We have all been there, the dreaded acne outbreak. This always seems to arrive at the most inconvenient of times. Suffering from a bright red blemish? We’ve got you covered with a list of three acne treatment options guaranteed to get your complexion back to looking its best. You can buy over the counter topical treatments from your local beauty and health store, or pharmacy. More serious cases of acne may require systemic treatment in the form of oral medication as prescribed by your doctor or dermatologist. Self-care and good hygiene practices can improve and even eradicate acne in mild cases. Acne is a skin condition that can occur on the face, neck, shoulders, chest and back. Acne varies from person to person, with some cases being mild and able to be cured with over-the-counter medications, while other cases are more serious and require a medical professional’s expertise. Before rushing out to buy the first acne treatment you see on the shelf, take a moment to analyse your blemishes. There are two categories in which acne blemishes fall; namely non-inflammatory and inflammatory lesions. Non-inflammatory acne is less severe and comes in two forms; whiteheads and blackheads. Whiteheads occur when skin pores become clogged with oil, dead skin or bacteria. A blackhead is a blocked skin pore (a whitehead) which has remained open, resulting in discolouring once in contact with the air. Mild to moderate non-inflammatory acne is easily curable with over the counter medications and home remedies. Inflammatory acne is more severe and may lead to other skin complications, dark spots and scarring if not treated. The four types of Inflammatory acne are; papules, pustules, nodules and cysts. Papules are inflamed blemishes where the walls of the pores of the skin have broken down and become hard and tender to the touch. Papules are pink to red in colour and form a small raised bump on the surface of the skin. Pustules are the next stage of papules. As the papules walls continue to deteriorate white blood cells flood the area in an effort to restore the pore. The white blood cells cause the formation of puss which gives the pustule its distinct white head appearance. 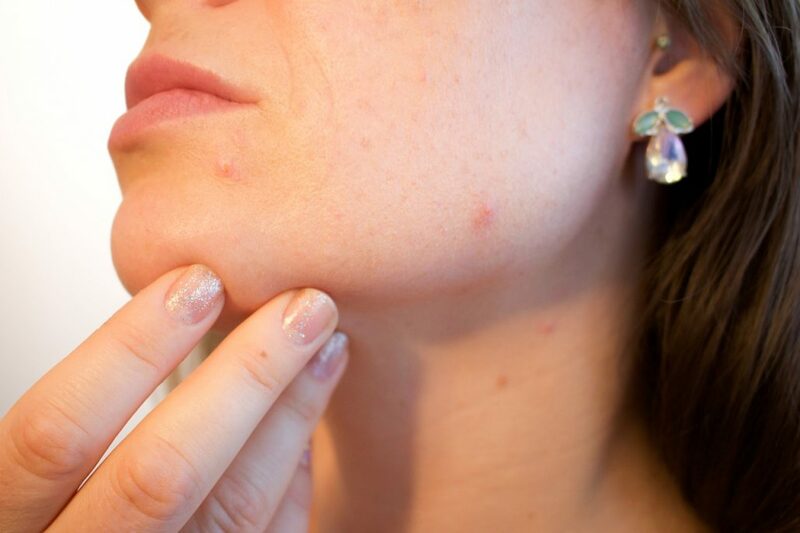 Nodules or nodular acne is a severe form of acne which affects the deeper levels of the skin and cannot be treated with over-the-counter medication. Nodular acne occurs when pustules are aggravated further causing them to grow and affect deeper underneath the skin. To treat nodular acne, you will need to consult a dermatologist who will examine the severity of your acne and then prescribe oral medication. Cysts or cystic acne is the most severe type of inflammatory acne. Cysts are very large, red, pus-filled pores which are quite painful. Cysts form at an even deeper level than nodular acne and are a result of a severe infection. Cystic acne will not go away by itself and will result in scarring if not treated. A consultation with your dermatologist is the best treatment for cystic acne. 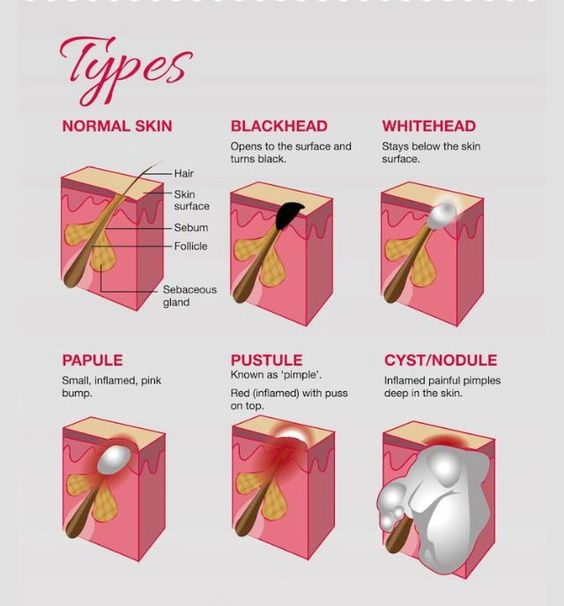 The below image shows the different types of pimples you may be experiencing. Now that you have analysed your blemishes and have a little background into what causes acne, let’s discuss the three acne treatment options you can explore. Topical acne treatment refers to medication that is applied to the body surface in the form of creams, gels, foams or ointments. Topical acne treatment is only recommended for mild acne outbreaks. There is a wide range of over-the-counter acne cleansers, but the best treatments are products which include acne fighting ingredients such as benzoyl peroxide, glycolic acid, salicylic acid, or sulfur. Benzoyl peroxide kills bacteria causing acne. Glycolic acid is often used in conjunction with Benzoyl peroxide due to its ability to inhibit acne bacteria growth. Salicylic acid helps to unblock skin pores, dissolve skin debris and prevent blemishes. Sulfer is used in conjunction with Salicylic Acid and Benzoyl peroxide due to its ability to remove dead skin cells from blocked pores. Systemic acne medications are drugs such as antibiotics or hormone pills that spread throughout the body via the bloodstream to clear the acne infection from the inside out. Antibiotics are often used to kill bacteria and reduce inflammation in severe cases of acne where there is an infection. Birth control or hormone medication can also be prescribed to control hormonal acne outbreaks. It is important to note that oral drugs such as antibiotics and hormone pills cannot be bought over-the-counter without a doctor’s prescription. Acne is also known to be triggered by unhealthy lifestyle practices and choices. By adjusting your lifestyle and working on the below factors you may be able to prevent an outbreak from even happening in the first place. Ensure you maintain a good skincare routine by washing your face twice daily. Ensure you wash your face after exercise or if you wear makeup. Do not go to bed wearing makeup. Avoid the use of oily face and hair products. Do not over exfoliate your skin as this can irritate and inflame the skin. Include acne-fighting foods in your diets such as fresh vegetables and fish. There are also many natural home remedies one can try to clear up a mild case of acne. These are common household items or products that can be bought from any health shop or grocery store. Apply Apple Cider Vinegar: Apple cider vinegar contains organic acids that help kill the bacteria that cause acne. Take a Zinc Supplement: Zinc is known to have anti-inflammatory properties and fights off bacteria. Honey: Honey has antibacterial properties, reduces inflammation and aids in the skin healing process. Tea Tree Oil: Tea tree oil is a natural antiseptic and great for acne spot treatment. Green Tea: The anti-inflammatory properties help to reduce redness and swelling associated with acne. Witch Hazel: The anti-inflammatory properties of witch hazel can help soothe skin inflammation. Witch Hazel is also an astringent as it contains tannins, which helps shrink skin pores. Aloe Vera: The antibacterial and antifungal useful in treating inflammation like boils and cysts on the skin. Omega-3: Omega-3 fatty acids are natural anti-inflammatories. You can get the benefits of Omega-3 by taking fish oil supplement or by including seafood such as salmon and mackerel in your diet. Read the full article on how to use these products to treat acne here. When it comes to pimples and acne you can feel pressured to get a quick fix or worse pick at your pimples. Below is a list of things you absolutely must not do. Never pop your pimples! Doing this can lead to scarring, spread infection, and worsen breakouts. Do not excessively touch your face or pick at your skin as bacteria from your hands may spread to your pores. Do not scrub your skin as this will further irritate your inflamed skin. Do not over wash your face as this can make pimples worse. Do not use over-the-counter acne treatments in addition to prescriptions without checking with your doctor. Do not get despondent. Be patient with your skincare treatment as you may only see improved results in a few weeks’ time. Do not apply toothpaste to acne as this does not work. Toothpaste is too strong for the skin and leads to extreme dryness. Use non-comedogenic moisturisers, foundation and makeup as they won’t clog pores or worsen breakouts. Ensure you wear sunscreen everyday even if you are not experiencing a breakout as the strong ingredients in acne medications can increase skin sensitivity. Use alcohol-free skin products to prevent skin dehydration. You can apply ice for relief in severe cases where acne lesions are swollen and painful. Follow a healthy, balanced diet, and avoid those acne-inducing foods listed earlier on. When to see a Doctor/Dermatologist? If you have tried a number of different over-the-counter acne treatments and your complexation has not improved or if it has deteriorated further, then it is time to seek professional help. You can make an appointment with your local GP who can refer you to a dermatologist if the case is deemed severe and requires specialist treatment. Your dermatologist will be able to provide you with a skincare regime that is designed specifically for your skin type and needs. Acne is not only skin deep, it can also affect a person’s confidence, lead to low self-esteem and depression in teenagers and adults. Don’t lose hope, acne is not incurable and there are many options and treatments available to get you back to looking your best in just a few weeks! Identify your type of acne outbreak. Get the correct treatment for your type of acne – not all Acne is treated the same. Identify what is triggering your acne outbreaks and adjust your lifestyle accordingly. Seek professional medical help for severe cases of acne. Hope you found the above helpful in your quest to get rid of those troublesome pimples.